Enjoy a guided tour and explore the history of Honolulu and Waikiki. From palaces and war memorials to 100 year old trees and movie film locations. A local guide will share facts of an ancient Hawaii and modern day. You'll learn why we call it Diamond Head and what O'ahu means, as well as plenty more. A great tour for the whole family! Route is mostly flat and a mix of bicycle lanes, paths, and quiet streets. The tour starts at our convenient location on the corner of Kaiulani and Kalakaua. We'll make sure everyone is on the right sized bicycle and give you a safety introduction. From there we'll head along the Waikiki waterfront with a stop at several statues and memorials. We'll loop back behind Waikiki and make our way towards downtown Honolulu. We'll stop at the recently renovated Thomas Square and talk about the British occupation of Hawaii. 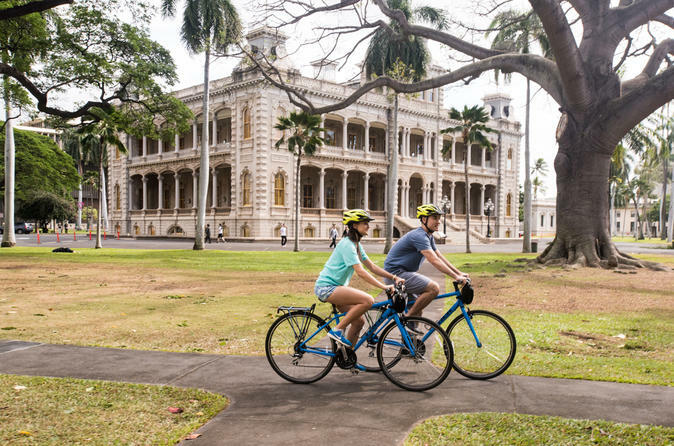 We'll ride onto the grounds of the Iolani Palace after passing the Honolulu Hale and State Capital. Depending on availability, we may stop at the Home of the Brave Brewseum. We'll ride back through Kaka'ako and stop at an interactive now-and-then display of Honolulu. As we ride back into Waikiki we'll discuss the history of the Ala Wai Canal and Waikiki. Our ride will finish back at our shop in Waikiki. Tour includes our basic hybrid bike rental, a bottle of water or powerade, snacks along the way, and a knowledgable local guide. Electric-assist bicycles are available for an additional fee. We have youth bikes and accessories to make this a great option for the whole family!